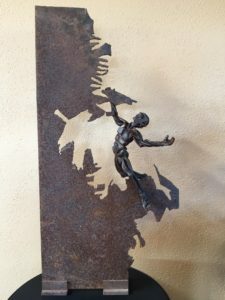 Julia is an award winning professional figurative sculptor living in Fallbrook California who is versatile in a wide range of media - steel, mesh, ceramics, concrete, plaster, bronze, wax, mixed media - and often incorporates found wood and rusty steel artifacts thus preserving history in her sculpture. Her works have been described as dynamic, edgy and dramatic revealing an artist who has melded an intellectual understanding of human physiology and anatomy with a knowledge of mechanics from her life-long profession as a medical device inventor and entrepreneur (inventing the tools that physicians use, www.MedicalDevice.com), thus creating a dichotomic style and unique, expressive body of work (www.FineArtSculpt.com, Art page). 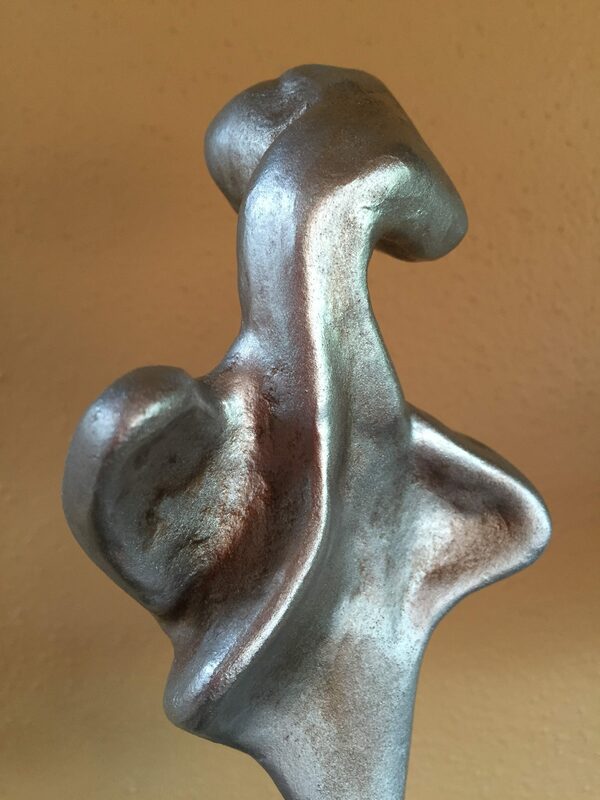 Julia creates sculpture in series that range from realistic figures to highly abstract stylized designs. Her works can be seen at the San Diego Botanic Garden and other public venues and galleries. She holds Open Studio, Workshop, and Artist Retreat events at the San Diego Artist Retreat she founded at her Fallbrook mountaintop avocado ranch studio and gallery. My next sculpture workshop will be teaching air-dry clay sculpture with the incorporation of found objects. 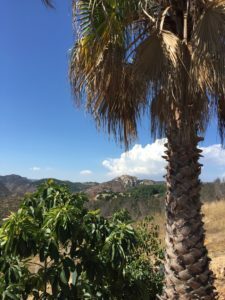 It will take place at my San Diego Artist Retreat air-conditioned studio in Fallbrook the first two weekends in August. A number of spaces are already taken. Air-dry clay does not require kiln firing, is light weight, and allows a more versatile design as any material e.g., wood, plastic, metal, paper, etc. 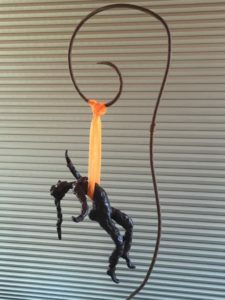 can be incorporated and an internal wire armature allows the sculpture to be easily posed in any configuration and wired to various objects or hung. It can also be reworked once dry. 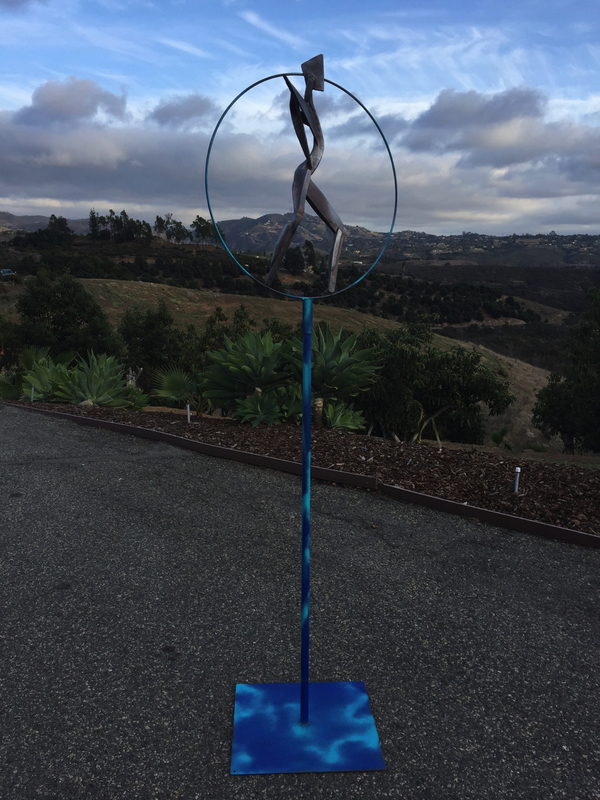 I presently have a sculpture with air-dry clay at the San Diego Botanic Garden for 2018-2019. I sold four air dry clay sculptures at the last Sculptural Objects Functional Art and Design (SOFA) show in Chicago. Materials: Materials are provided and tools loaned. Bring found objects to incorporate and to use as a base for your sculpture (optional). Registration: Email Julia at jsrasor@gmail.com to receive a Registration Form. Receipt of a completed form and payment check will reserve your place in the workshop. Workshop Instructions will then be emailed to you. This will be a fairly small group of students for maximum one-on-one interaction. A number of spaces are already taken. When the workshop is full, you will be placed on a waiting list, notified of any cancellations, and be among the first in line for the next workshop. Call Julia if you have any questions at 408-395-3335. As a medical device inventor and entrepreneur (inventing the tools that physicians use, www.MedicalDevice.com), Julia S. Rasor explores materials and often uses found artifacts in her sculpture that will both, convey topics she is passionate about and preserve time, resulting in a unique, expressive body of work (www.FineArtSculpt.com). 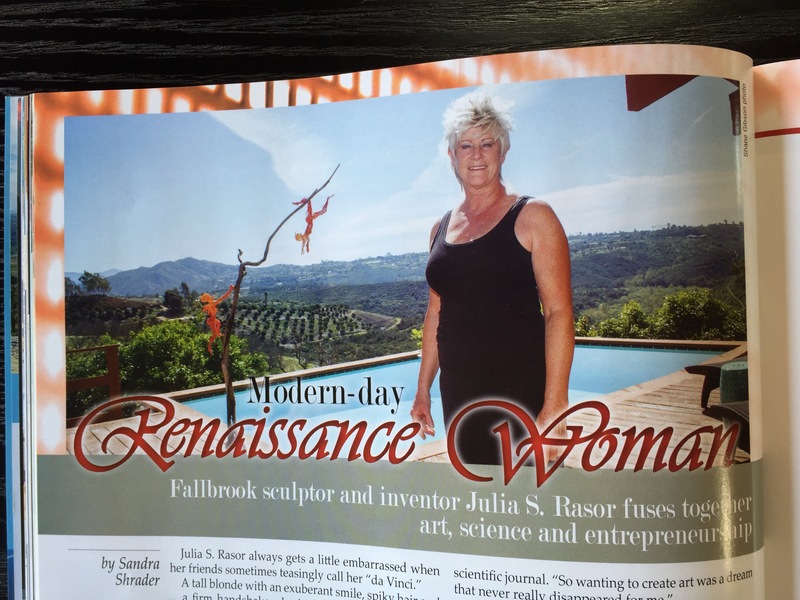 The Greater Fallbrook Area Sourcebook 2016 feature: pages 56-59. 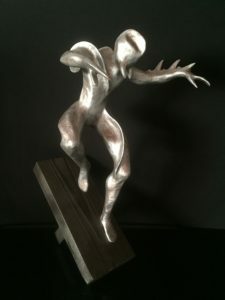 Her sculpture series include world events (The Recession and Modernism), the afterlife (Spirits), high fashion (Haute Couture, Avante-Garde), nudes, dancers, warriors, guardians, and strange departures into the unusual (FractAliens, a fractured alien). 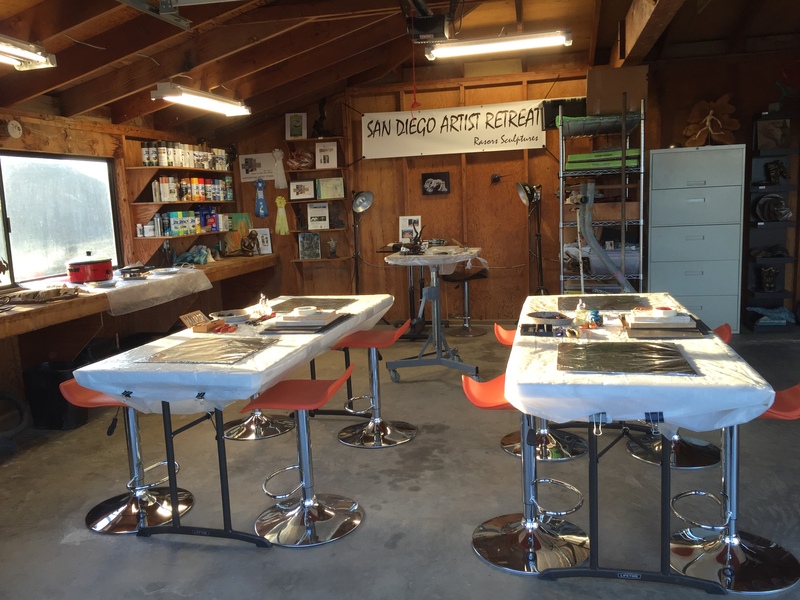 Her works can be seen at the San Diego Botanic Garden and other public venues and galleries. 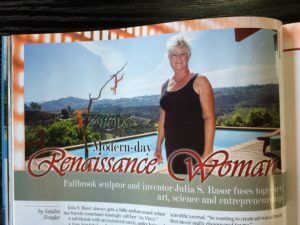 Julia founded the San Diego Artist Retreat in Fallbrook, an art immersion experience, where she holds workshops and studio/gallery tours. 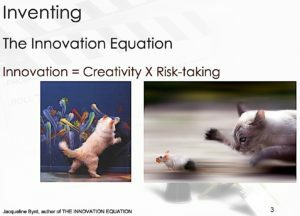 The presentation includes examples of the innovative processes I use with both my sculpture and my medical device patents. Students can analyze what creative process they have used to date to create art, then advance into new territory by learning new ways to innovate. 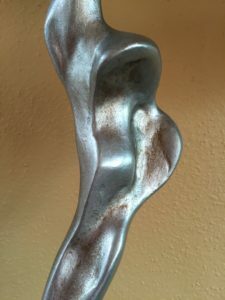 In my series of postings for this workshop I have been showing a variety of examples of my sculpture made from air-dry clay. My 4th example is “Late for the Masquerade” which has objects saved from my San Diego Artist Retreat casita construction (you can book a retreat in this casita online at the San Diego Artist Retreat). By using these objects both in the figure and as an architectural background, they were upcycled to produce a one-of-a-kind sculpture. Registration: Email Julia at jsrasor@gmail.com to receive a Registration Form. Receipt of a completed form and payment check will reserve your place in the workshop. Workshop Instructions will then be emailed to you. This will be a fairly small group of 7-9 students for maximum one-on-one interaction. A number of spaces are already taken. When the workshop is full, you will be placed on a waiting list, notified of any cancellations, and be among the first in line for the next workshop. Call Julia if you have any questions at 408-395-3335. Students will incorporate their own found object artifacts into a one-of-a-kind figurative sculpture. All experience levels are welcome. Instruction is tailored to individual goals. 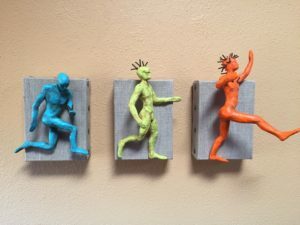 Her sculpture series include world events (The Recession), the afterlife (Spirits), high fashion (Haute Couture, Dancers), and strange departures into the unusual (FractAliens). 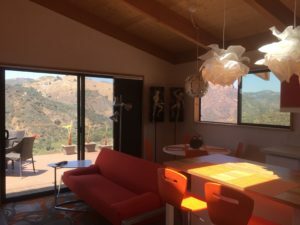 Her 12 exhibitions last year included Sparks Gallery, San Diego Botanic Garden, 50 to Watch, and a Solo Exhibit at Fallbrook Library. This year’s exhibits include Sparks Gallery, San Diego Botanic Garden, Encinitas City Hall Solo Show, and La Playa Gallery three artist show in La Jolla. 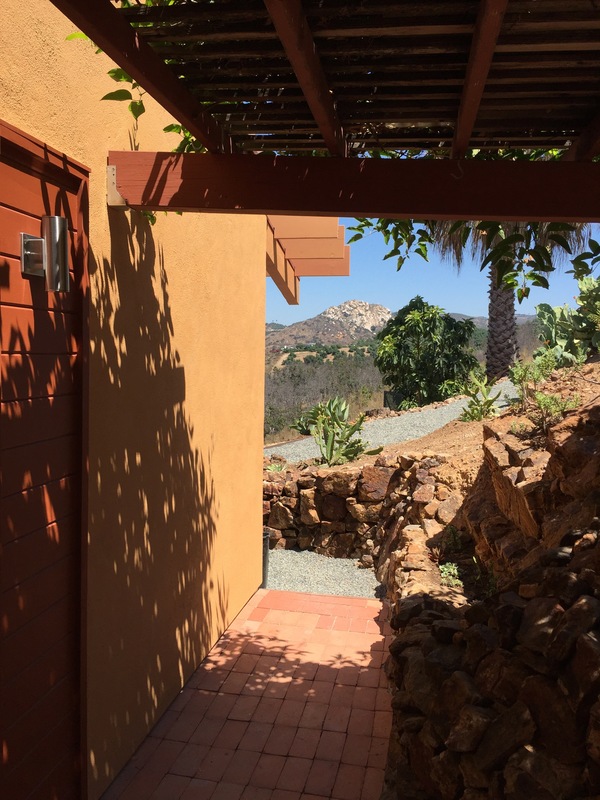 Julia founded the San Diego Artist Retreat in Fallbrook, an art immersion experience, where she holds workshops and studio/gallery tours. 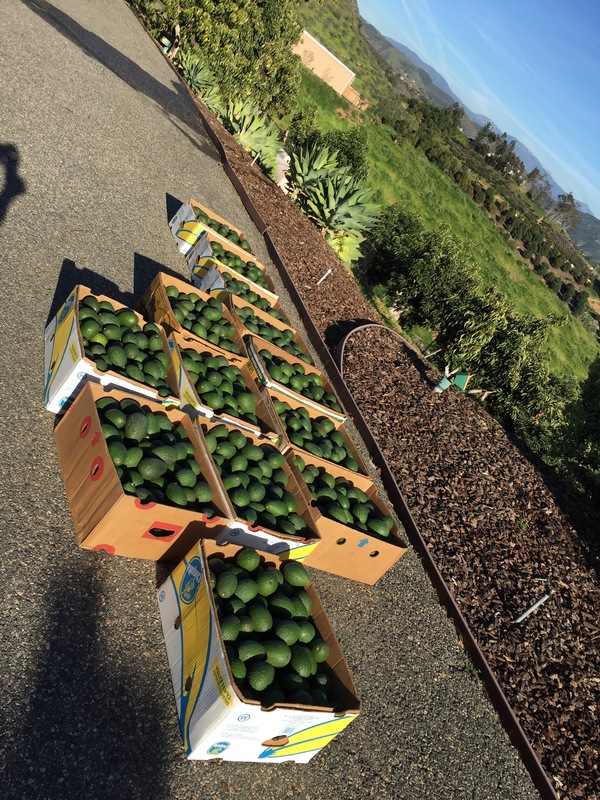 Overnight guests can book a stay in the private casita (Avocado Ranch/Artist Retreat, Private Casita, Pool). Artists, vacationers, or business travelers – come enjoy my artist retreat and working avocado ranch. 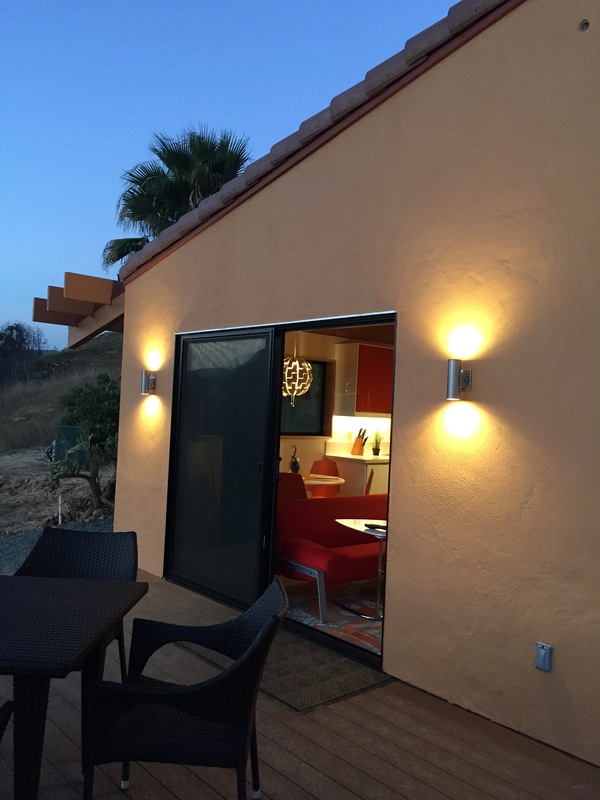 Stay in a private, fully outfitted casita, enjoy the pool. 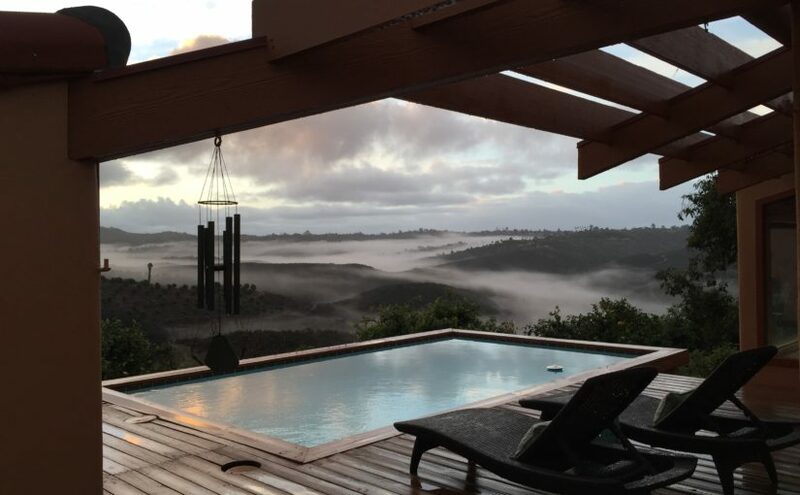 Book your time online at the San Diego Artist Retreat in Fallbrook, California. Relax and get away from it all. Solo, with friends, or plan a romantic couple escape, take in the nature and beauty. Artists, use the studio work space and/or take a workshop (workshop information) in the large air conditioned studio. Sunshine and quiet provide an experience that sparks and fosters personal creativity and provides for reflection and refinement of artistic work. 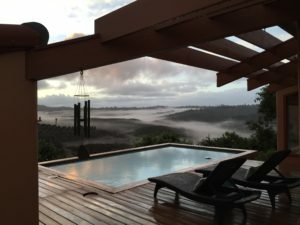 This is a great alternative to a hotel room – business travelers – instead of a mundane hotel room, enjoy a unique experience which includes living with art: a continually growing collection of original art embellishes the casita interior and retreat grounds and living among the avocado groves. 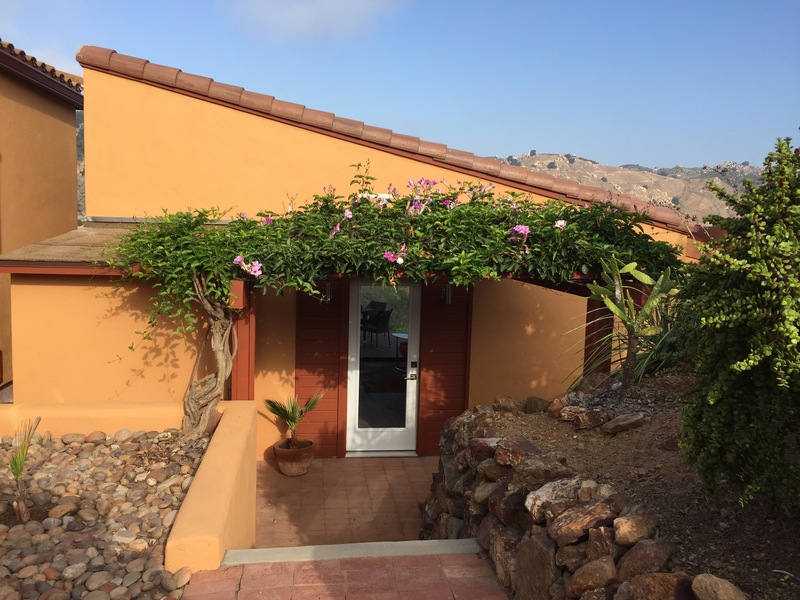 This beautiful, fully outfitted, air conditioned, vaulted ceiling luxury casita is your private oasis during your stay. It is a spectacular rural mountaintop retreat, gated estate on 4-acres, close to downtown Fallbrook in De Luz Heights. 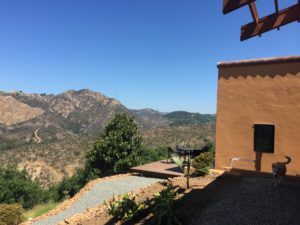 Relax on the private casita deck overlooking an avocado grove surrounded by gorgeous views, mountaintop breezes, and sunsets with starry nights free from city lights or enjoy a dip in the infinity pool. 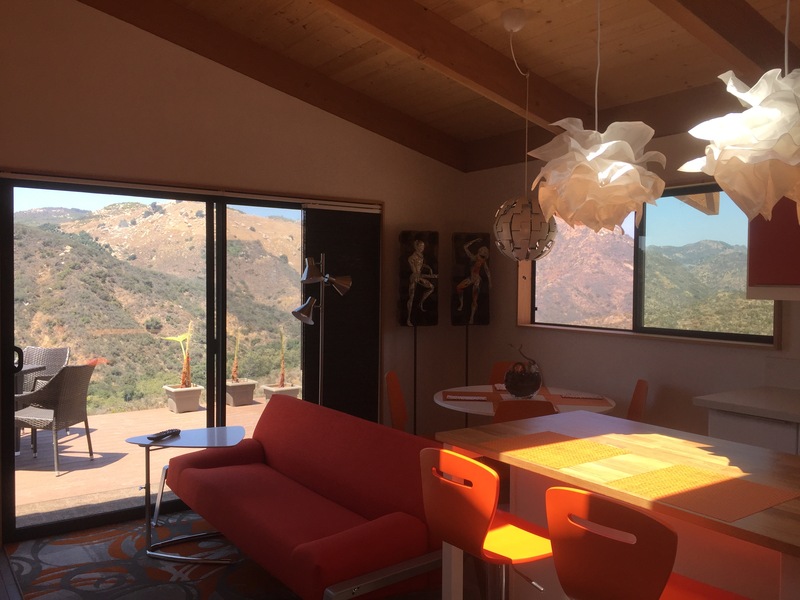 Surrounded by beautiful mature landscaping dotted with the owner’s sculpture, the private, completely separate casita has brand new contemporary furnishings with a midcentury modern vibe. 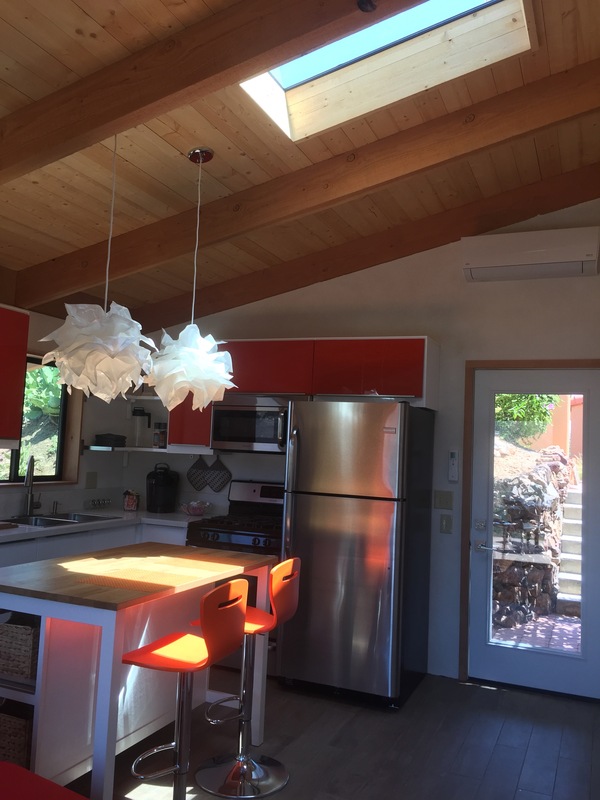 The skylight, open beams, interior window, barn doors, and other interesting architecture mimic that of the main house built by a well-known architect/artist. The casita has a private bedroom: twin bed that pulls out to a king size, a fold up desk, an en suite bathroom and walk-in closet; living room with a couch that converts to bed for one person; full kitchen with gas oven and range; dining table for 4; breakfast bar for 2; deck dining area with table and 4 chairs; TV; DVD player; Wifi; internet; A/C and heat. Fallbrook is almost always sunny, and much of the time cool mornings and nights from the marine layer. It was founded in 1869, is known for its avocado groves and claims the title “Avocado Capital of the World.” It is often called or known as “The Friendly Village” so explore our small town’s agriculture and culture, shop in locally owned farmer’s markets, clothing boutiques, art galleries, antique shops, and enjoy our fine eateries, have a coffee or a high tea (complete with china, tablecloths, and a hat!). 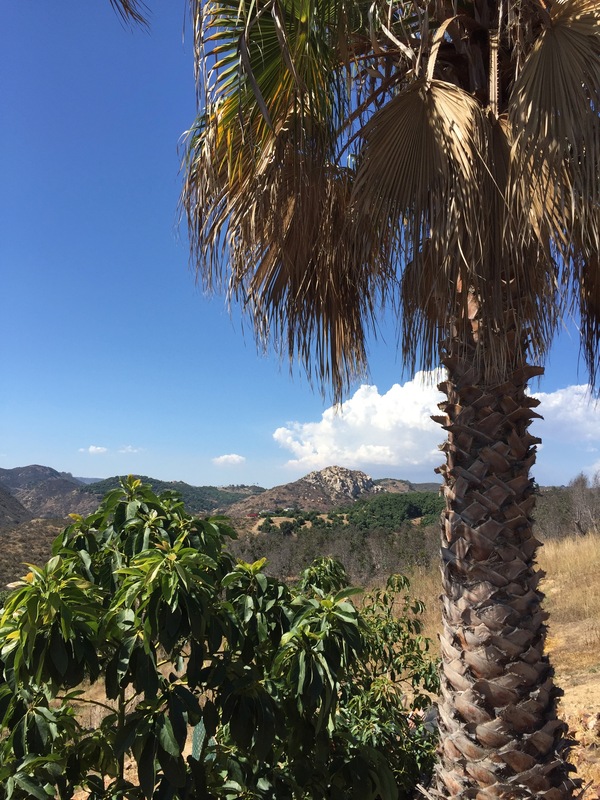 Hike nearby at the Santa Margarita river wilderness with 14 miles of trails (7 minutes) or climb Rock Mountain (14 minutes)! 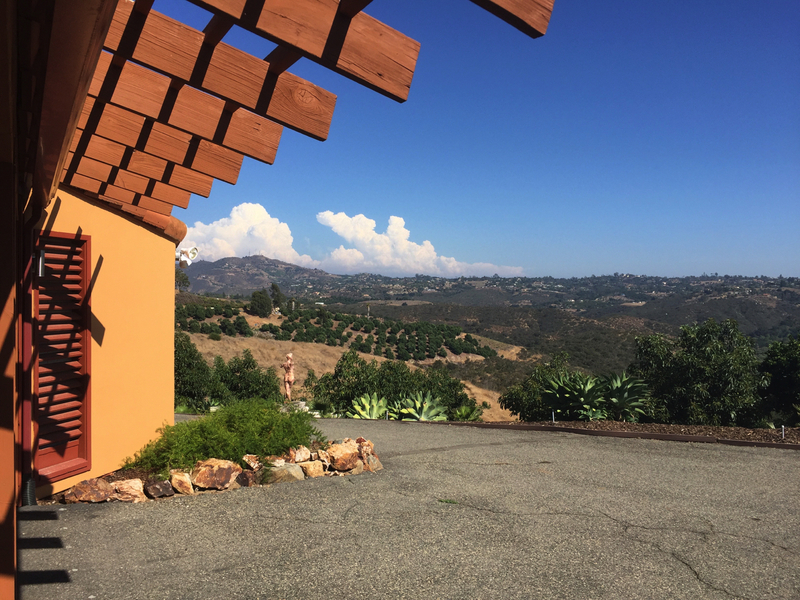 Go wine tasting in town or nearby Temecula (30 minutes), or to the beach in Oceanside (35 minutes). There are great routes from the property through the neighborhood to walk, run, or bicycle. 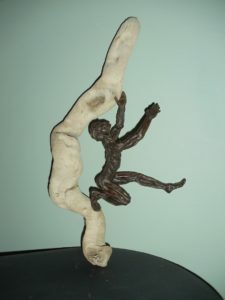 I have been asked to have my next sculpture workshop be teaching air-dry clay with the incorporation of found objects. It will take place at my San Diego Artist Retreat studio in Fallbrook next month (see workshop information and sculpture examples on Julia’s Blog). Air-dry clay does not require firing, is light weight, and allows a more versatile design as any material e.g., wood, plastic, metal, paper, etc. 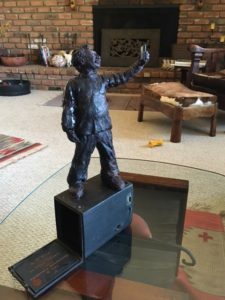 can be incorporated and an internal wire armature allows the sculpture to be easily posed in any configuration and wired to various objects. Students will incorporate their own found object artifacts into a one-of-a-kind figurative sculpture. Contact Julia to receive a Registration Form. Receipt of a completed form and payment check will reserve your place in the workshop. Workshop Instructions will then be emailed to you. This will be a fairly small group, up to nine students for maximum one-on-one interaction. A number of spaces are already taken. When the workshop is full, you will be placed on a waiting list, notified of any cancellations, and be among the first in line for the next workshop. Call Julia if you have any questions at 408-395-3335. Julia merged her art and science careers – it not uncommon to see her fearlessly experiment with a wide range of media and subjects resulting in sculptures that emanate both dark and light emotion – Yin and the Yang. 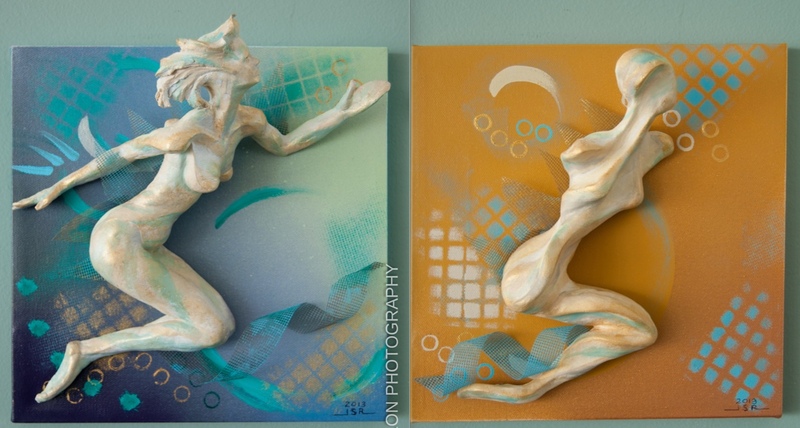 Her sculpture series include world events (The Recession), the afterlife (Spirits), high fashion (Haute Couture, Dancers), and strange departures into the unusual (FractAliens). Her 12 exhibitions last year included Sparks Gallery, San Diego Botanic Garden, 50 to Watch, and a Solo Exhibit at Fallbrook Library. This year’s exhibits include Sparks Gallery, San Diego Botanic Garden, Encinitas City Hall Solo Show, and La Playa Gallery three artist show in La Jolla. 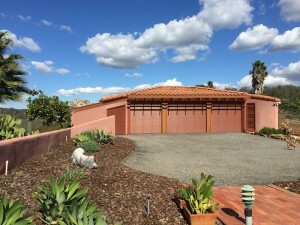 Julia founded the San Diego Artist Retreat in Fallbrook, an art immersion experience for artists, collectors, and visitors, where she holds workshops and studio/gallery tours, overnight guests can book a stay in the private casita (Avocado Ranch/Artist Retreat, Private Casita, Pool). 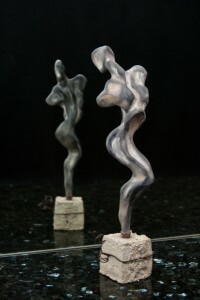 Air-dry clay works well for abstract figures – unlike fired water-based clay, an internal wire armature can be permanently incorporated. 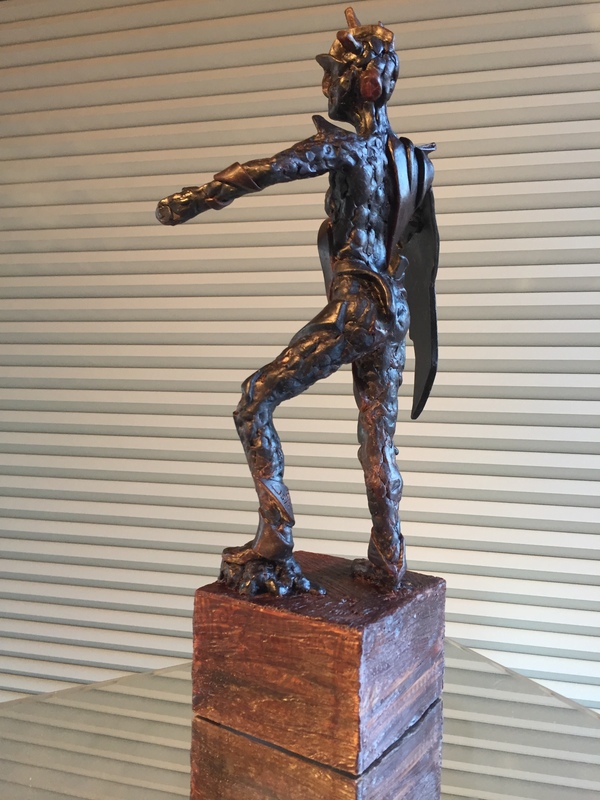 As an example, see my sculpture “Shadow Spirit” below – purchased by a collector at last year’s Open Studios San Diego run by The Studio Door gallery. As another example, “Willow Spirit”, curated by Sparks Gallery owner for exhibition in the PHYSIQUE show. 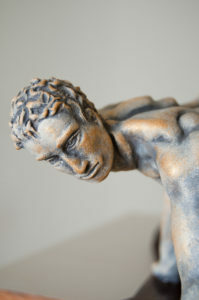 Pictures of the sculpture detail show the metallic patina capabilities of the material. Join us in this workshop of sculpting using high quality air-dry clay with the incorporation of found objects. It will take place at my San Diego Artist Retreat studio in Fallbrook next month. 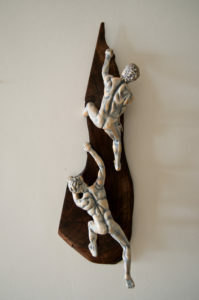 Air-dry clay works well for wall sculpture as it is lightweight and can be easily wired in place on a canvas or other object. 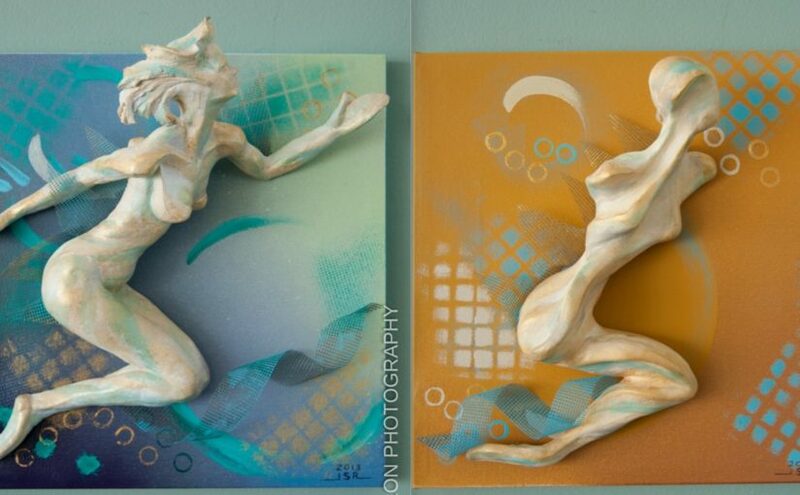 As an example, my pair “Surf Goddess” and “Sun Goddess, show the Yin and Yang of surf and sun, cool and warm, realism and abstraction – these wall sculptures were purchased via auction by a collector. 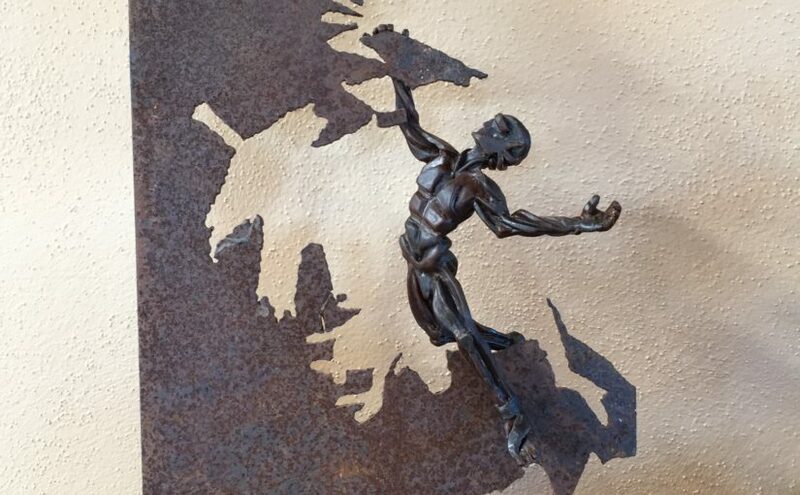 Air-dry sculpture “Mantle the Crag”, a rock climber sculpture, was commissioned by a collector. A tribute to my fellow climbers. 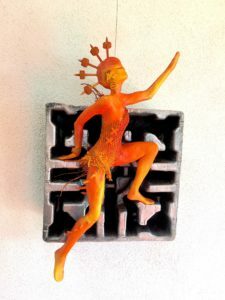 I have been asked to have my next workshop be teaching air-dry clay sculpture with the incorporation of found objects. It will take place at my San Diego Artist Retreat studio in Fallbrook next month. 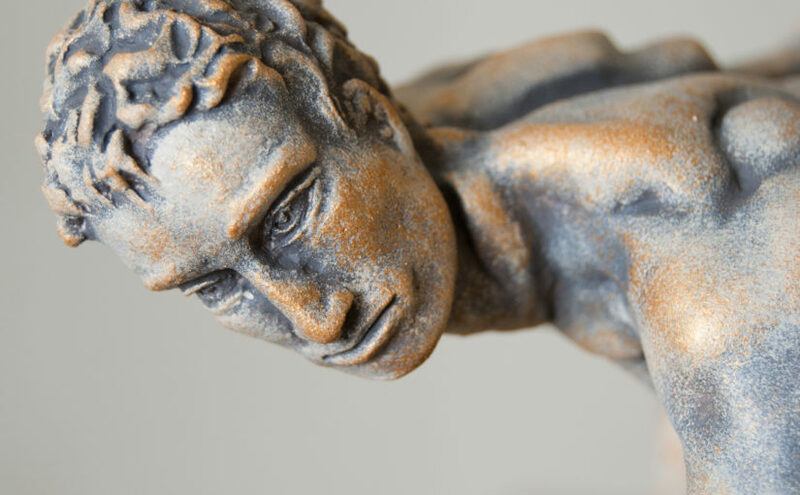 Air-dry clay does not require firing, is light weight, and allows a more versatile design as any material e.g., wood, plastic, metal, paper, etc. 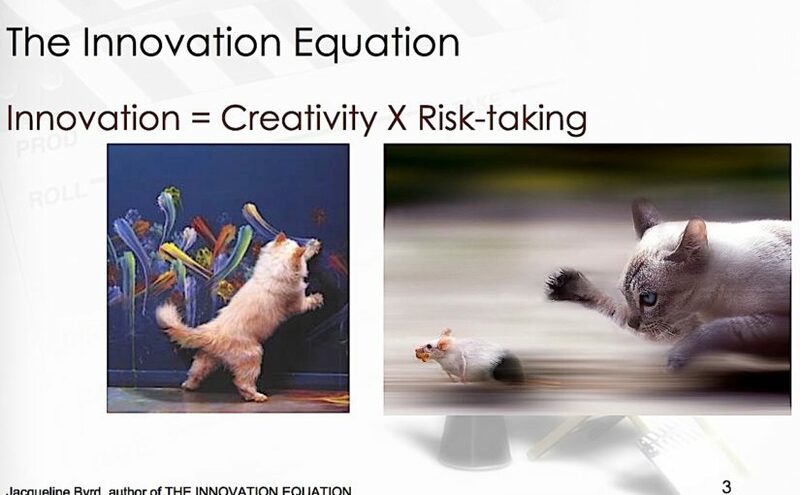 can be incorporated. 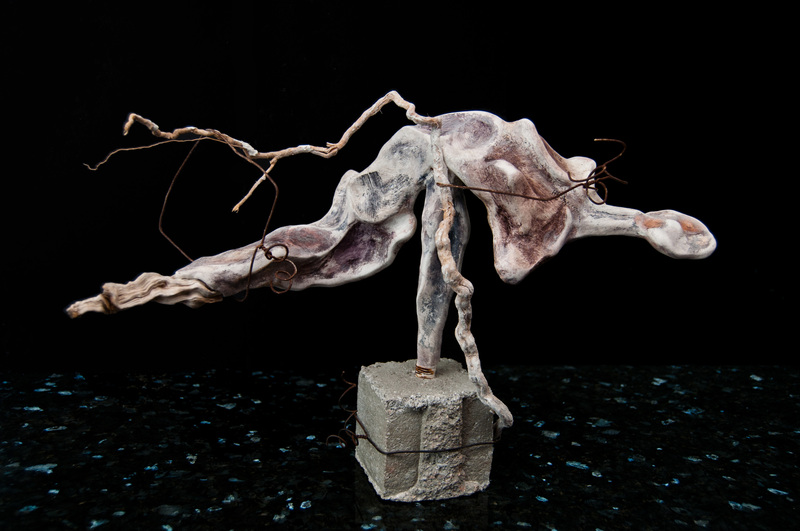 In addition, an internal wire armature allows the sculpture to be easily posed in any configuration and wired to various objects. 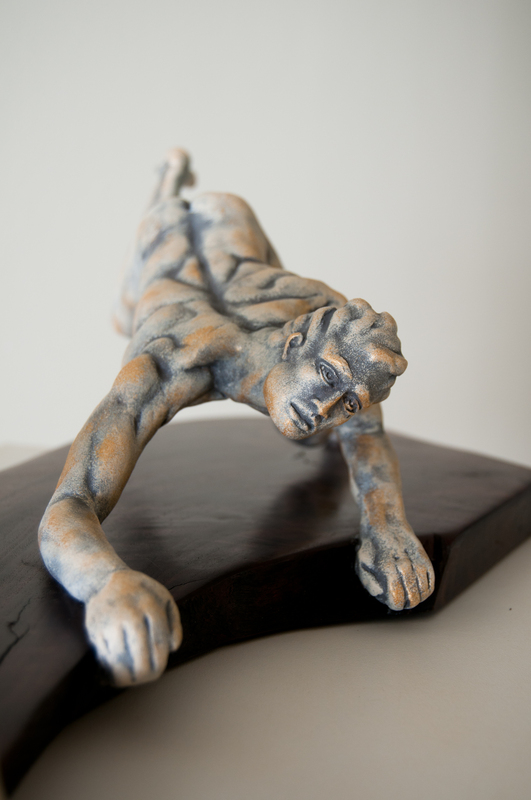 Being able to incorporate a variety of materials in a sculpture is a feature I particularly like about air-dry clay. 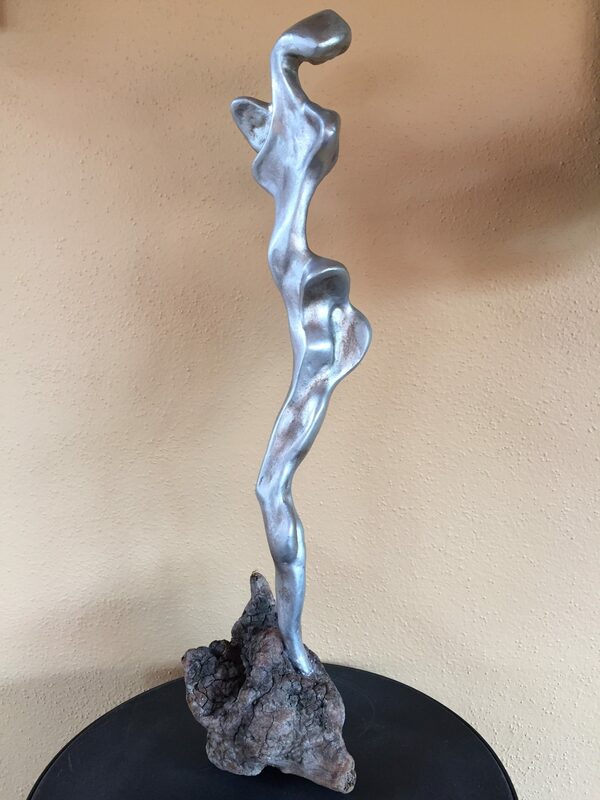 In my travels I collect interesting twisted roots, textured dry desert branches, shells, etc. which I incorporate into sculptures such as in my Spirit Series. I also attach air-dry sculptures onto found object bases such as with my Willow Spirit sculpture and Rock Climber sculptures. 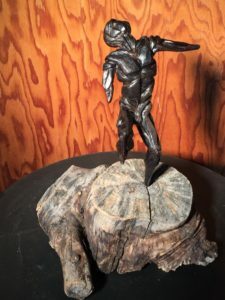 Making sculpture in this way is very personal and specific to the artist – it preserves a history important to them via their collected artifacts into a piece of art – a heritage and memories that can be passed down to family members. 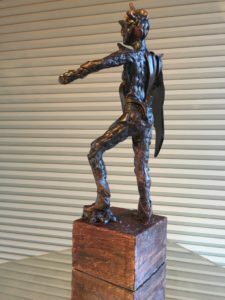 Constructing the sculpture in the form of a figure captures the artist’s emotion associated with the gathered objects and projects it into the piece. 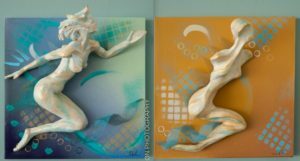 Her sculpture series include world events (The Recession), the afterlife (Spirits), high fashion (Haute Couture, Dancers), and strange departures into the unusual (FractAliens). Her 12 exhibitions last year included Sparks Gallery, San Diego Botanic Garden, 50 to Watch, and a Solo Exhibit at Fallbrook Library. This year’s exhibits include Sparks Gallery, San Diego Botanic Garden, Encinitas City Hall Solo Show, and La Playa Gallery three artist show in La Jolla. Julia founded the San Diego Artist Retreat in Fallbrook, an art immersion experience for artists and collectors, where she holds workshops and studio/gallery tours, overnight guests can book a stay in the private casita (Avocado Ranch/Artist Retreat, Private Casita, Pool). Group and private workshops were completed in June and I am pleased to present some of the students’ works in wax (soon to be bronze masterpieces) in the section below. 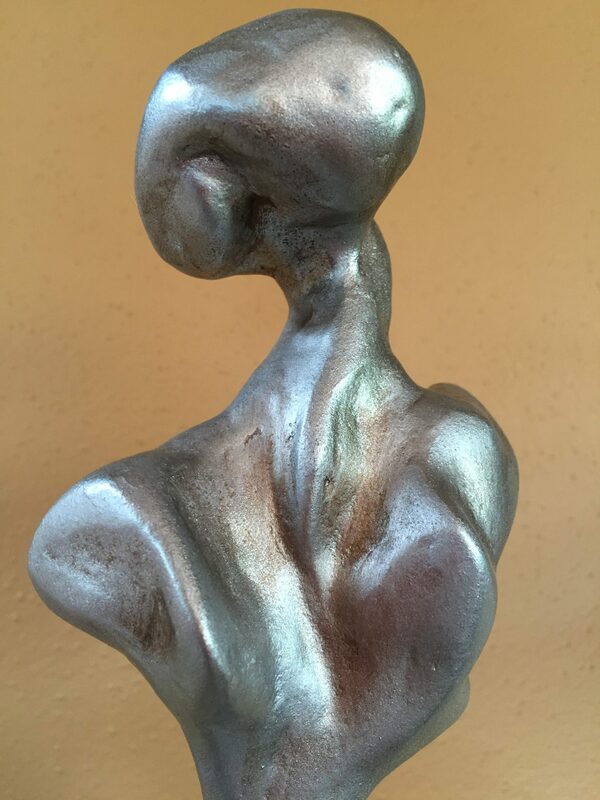 Stay tuned for photos of the artists with their final finished bronzes! My next Wax to Bronze figure workshop begins Saturday August 13 – see information below. I have prepared a demonstration piece for the class titled Summoning FractAlien – see more photos of this sculpture below. 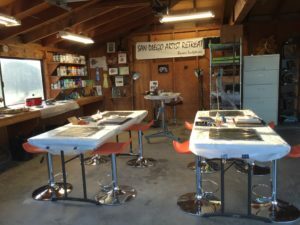 Students completed their wax figures taught at my San Diego Artist Retreat studio in De Luz Heights. Very remarkably, for some, this was their first figurative sculpture, for all, their first wax – wax is a more challenging medium than clay. Students chose a variety of subjects including hanging, active, and static sculptures of various sizes and both genders. Here are some of my students finished sculptures. 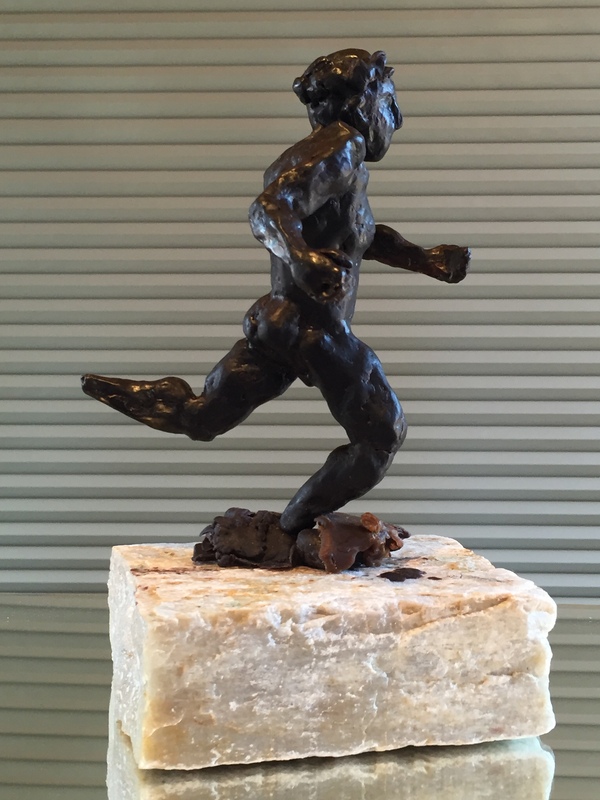 Vesuvio, a muscular runner on a stone base, by Dianne O’Bannon (note wax underfoot temporarily placed to photograph figure on base). Uplifted, a lady with a textured surface suspended from a found hook base, by Reba H. Lemmons. Use No. 2 Film, the sculptor’s husband taking a selfie with a cell phone standing on a family Brownie Camera base, by Wendy M. Johnson. I am very proud of these students’ works and look forward to seeing where they go from here. More of the instructor’s sculpture can be seen at RasorsSculptures.com. As background, Julia has a number of awards for her works including First Place in Ceramics twice at the San Diego County Fair, Del Mar, Fine Art Exhibit (4th largest fair in North America), Honorable Mention at the 5th Annual Fallbrook Art Center Artists Guild Show for her limited edition bronze Chopper Chick (presently at Brandon Gallery), a life-size steel mesh sculpture on exhibit at the San Diego Botanic Garden, Encinitas, and four curated sculptures for the PHYSIQUE Exhibition at the Sparks Gallery in the Gaslamp Quarter of San Diego – Opening Reception tonight. 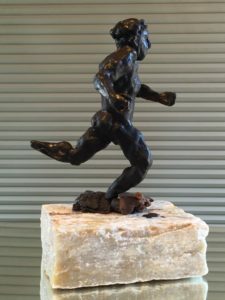 Acquiring the skill to sculpt in wax rather than clay can cut the time and cost to create a bronze sculpture by one third to one half because only one, rather than two molds is required. 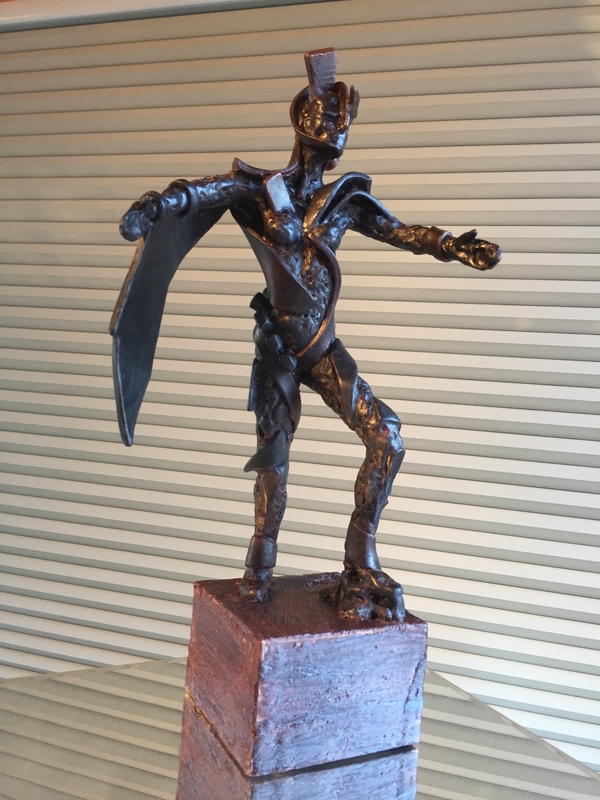 Students will make a 6 to 8 inch figure from sculpture wax that will be sent to the foundry to cast a one-of-a-kind bronze sculpture. 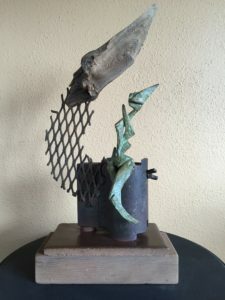 The base of the sculpture will be made from the artist’s found object(s) resulting in a piece that is very personal and specific to the artist – it preserves a history important to them. Constructing the sculpture in the form of a posed figure captures the artist’s emotion and thoughts and projects them into the piece. All experience levels are welcome. Instruction is tailored to individual goals. Registration: Email Julia at jsrasor@gmail.com to receive a Registration Form. Receipt of a completed form and payment check will reserve your place in the workshop. Workshop Instructions will then be emailed to you. This will be a fairly small group of students for maximum one-on-one interaction. 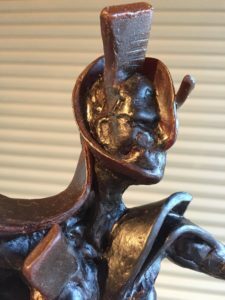 Acquiring the skill to sculpt in wax rather than clay can cut the time and cost to create a bronze sculpture by one third to one half because only one, rather than two molds is required. 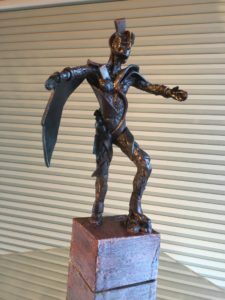 Students will make a 6 to 8 inch figure from sculpture wax that will be sent to the foundry to cast a one-of-a-kind bronze sculpture. Registration: Email Julia at jsrasor@gmail.com to receive a Registration Form. Receipt of a completed form and payment check will reserve your place in the workshop. Workshop Instructions will then be emailed to you. This will be a fairly small group of 8-9 students for maximum one-on-one interaction. Call Julia if you have any questions at 408-395-3335.